Universidad Nacional Toribio Rodríguez de Mendoza de Amazonas (UNTRM) was established in Chachapoyas (Amazonas) by Law No. 27,347 enacted on 18 September 2000. The Consejo Nacional para la Autorización de Universidades (CONAFU) allowed the initiation of academic work by Resolution No 114, adopted on 25 May 2001. UNTRM was managed by commissions appointed by CONAFU until granted complete autonomy by Resolution No. 627, adopted on 27 November 2009 by CONAFU. The first executive of UMTNR, elected on 21 November 2009, was recognized by Resolution No. 598, adopted on 24 November 2009 by CONAFU. UNTRM is named for Alejandro Toribio Rodríguez de Mendoza Collantes (1750-1825)), one of the most famous precursors of the Republic of Peru. Graduated in theology at the Real y Pontificia Universidad de San Marcos in Lima, Toribio Rodríguez de Mendoza served as a Professor of Philosophy and Theology at the Real Convictorio de San Carlos. He was eventually appointed Rector of the university. In his teaching, Toribio Rodríguez de Mendoza spread modern ideas; his disciples and friends founded the Sociedad Filantrópica, an anti-monarchist society that publicized the American revolution. Elected Representative of Trujillo, he presided the preliminary sessions of the first Constituent Congress, held in 1822 Dean of the College of Lawyers of Lima, Toribio Rodríguez de Mendoza is the namesake of the medal awarded by the Constitutional Court of Peru to people or institutions who have significantly contributed to the defense of the Constitution and human rights. He is also the namesake of a province of Amazonas. The flag of UNTRM is dark blue with the university's emblem. On the flag, the border of the emblem is blue with white letters, as opposed to the self-standing emblem. - a rhomb (in base) representing the main archaeological monument of Amazonas, the Kuélap fortress [http://peru-tripadvisors.com/blog/wp-content/uploads/2014/09/8.jpg - Photo]. Kuélap, a mountaintop fortress city, rivals any ruins in the new world and comes complete with living quarters for thousands of residents and a stone wall fortification reaching 60 feet high running in circumference to the city. Kuélap is considered the largest stone ruin site in the New World and is comprised of massive stone blocks nearly 10-times the volume of the blocks used in the Giza Pyramid. The fortress of Kuélap consists of massive exterior stone walls containing more than four hundred buildings. The structure, situated on a ridge overlooking the Utcubamba Valley in northern Peru, is roughly 600 meters in length and 110 meters in width and is thought to have been built to defend against the Huari or other hostile peoples. Archaeological evidence shows that the structure was built around 500 AD and occupied until the mid-1500s (Early Colonial period). 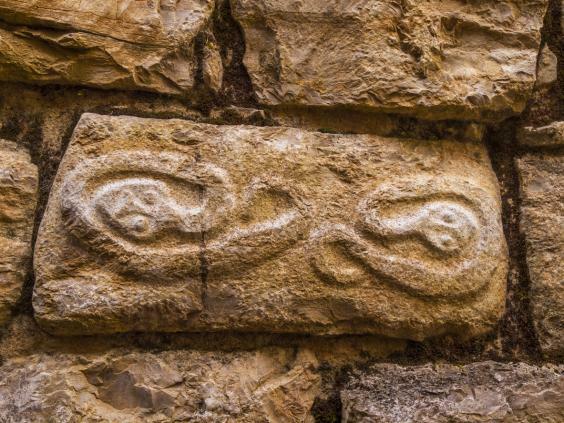 Nearby the ruins can be found “purunmachus” or stone tombs built in the shape of people that would have housed the mummified remains of Chachapoyas royalty. Before 2015/2016, UNTRM used a different emblem, oval with a colored representation of the monolith. The flag of the university was white, charged with the emblem, but with the border celestial blue instead of golden yellow on the self-standing emblem, and the lettering white instead of black. The flag with the old emblem was still seen in use on photos taken in 2017.